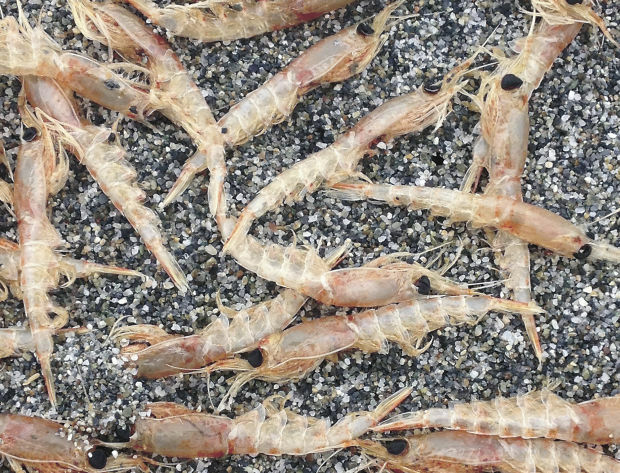 Bill Peterson, an oceanographer with the NOAA Northwest Fisheries Science Center in Newport, Ore., says millions of dead North Pacific krill have washed ashore recently between Newport and Eureka, Calif. He says it’s the largest die-off he can recall in recent history. North Pacific krill primarily live on the eastern side of the Pacific, between southern California and southern Alaska. They’re typically found along the continental shelf, Peterson says. 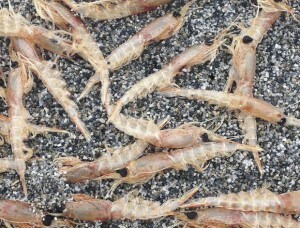 The shrimp-like crustaceans are an important source of food for salmon and other species of fish, birds and marine mammals. Joe Tyburczy, a researcher with the California Sea Grant Extension office and a former Oregon Sea Grant Knauss Fellow, says the culprit could be hypoxia. Indeed, oceanographic cruises along the northern California coast found lower oxygen levels than usually seen in Pacific Northwest waters. “If it is hypoxia, there’s a possibility of implications for other species like crab,” Tyburczy says. Another possibility, Peterson says, is that the shrimp were victims of unfriendly weather conditions during their mating cycle, and were driven to shore by high winds. For the moment, Peterson and Tyburczy are asking that the public keep them informed of any more dead krill sightings. Peterson can be reached at 541-867-0201; Tyburczy at 707-443-8369.